Today the gorgeous Wendy from Vegie Smugglers is kindly sharing one of her most popular recipes with us. 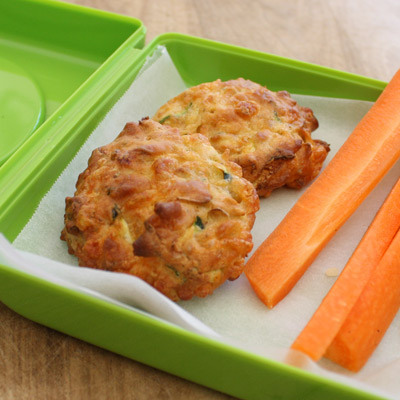 Cheese Puffs are perfect for the lunchbox and of course, involve a bit of vegie-smuggling! If you have a thermomix, it easily converts too! Preheat the oven to 190C. Line a baking tray. In a large bowl, whisk together the milk and egg. Add the paprika, zucchini, spring onions and cheese. Sift over the flour. Mix well (it becomes a thick paste). Dollop out large tablespoon size portions onto the tray. The mix makes about 16. Bake for 20-25 minutes until deep golden brown and cooked through. Store in the fridge in an airtight container for several days or you can freeze them. Let me know how you go with this recipe and what the kids think! I love them but I’m a bit of a vegie snob – top of the range for me are red capcium, broccoli carrots, sweet potato and pumpkin whereas cauliflower, green capcium and brussel sprouts live at the bottom! Thankfully my son doesn’t share my grading system – he loves them all! I love them all but especially son no two is a bit difficult to convert and needs that extra bit of smuggling! Although he likes it best when they are all cooked separately and he can clearly see them and choose which ones to eat. We have 3 boys – number 3 and number 1 loves veg, in fact number 3 prefers them over meat on his plate as long as they are mostly raw! number 2 is much more fussy and only eats carrot, cucumber, frozen peas, corn and potato and they must be separate and not touching anything else on the plate!! he is also incredibly stubborn and we have had many clashes over just trying the a new veg. We have recently introduced a week of trying recipes from other countries and are making a scrapbook of the most loved ones – so far Japanese was the biggest success, with lots of new veg being tried and also Thai would you believe – we kept it simple but have been really surprised by the things they actually wanted to try 🙂 Thanks for the giveaway opportunity – am always looking for good lunchbox ideas! The kids like a good amount of vegies, I’ll eat just about anything except soggy weet-bix, bleh, but it’s hubby who needs the smuggling done for him. 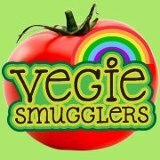 My kids & I all love veges but any extras that can be smuggled are always welcome! My kids hate vegies, I find it extremely difficult to get them to eat any! I on the other hand love vegetables, especially fresh ones straight from our vege garden! My son loves his green flowers (broccoli) and white flowers (cauliflower) and keeping it fun helps. I find I have to hide more vegies for my partner than I do for my son!! I love vegies and will eat pretty much any kind. Unfortunately my little 3 year old will pretty much only eat carrots! My kids love eating directly from the veggie garden but turn their noses up when veg appear on their plate at dinnertime. Our routine now is to visit the garden first to get their fill of veggies prior to having dinner. My 2 year old is very adventurous and will eat raw silverbeet, nasturtium leaves and flowers, carrots, zucchini flowers, sweet basil, beans and snow peas. We love our vegies and eat mostly vegetarian. Our 3-year-old however, is going through an ‘I don’t like that’ phase! We could all do with more vegies in our diet. The problem is not everyone liking everything. I have found that variety is key. I love my vegies and so does my 14 month old son, but unfortunately the same can’t be said for my 6 year old son, and my husband!! lol. I’m always having to hide vegies in there food because they are so fussy! We all like vege’s but little mister (3) get’s a bit bored of the same old same old. Why? Because I have no imagination! I would love to make eating healthy more interesting and imaginative as he gets older and more interested in what everything is and what it’s about. I also struggle with imaginative healthy food to take to playgroups etc. We like veges, but often my kids don’t like them as much as I would like them too! Especially in their lunch boxes. My daughter is about to start prep and I am getting excited about what I can smuggle into her lunchbox. She eats cucumber and cherry tomatos by the bucketload, but I enjoy discovering ways of getting more veggies into her! Yes, they love them but won’t eat any of them cooked! Only raw like in a salad. Raw peas, beans, carrots etc. Potatoes and pumpkin are the only ones allowed to be cooked. I would love one of these giveaways!! It’s extremely hard to get veggies into one DS as he is purely a meat and potato boy, and apples are the omly fruit he’ll eat. While his twin brother will try/eat most things, right down to anchovies and other seafood!! Ds1: crusty roll filled with tuna, avocado, tomato and cheese. Ds2: a slice of bread (nothing on it) and 2 hot dog sausages!! Love my vegies! Happily, I find my favourites are dictated by season. At the moment, I am loving zucchini (can’t wait to try cheese puffs), corn, avocados, cucumber… Ok, I love them all! We don’t have kids, but I’m really looking forward to checking out Vege Smugglers Lunchbox Planner. Hubby and I are getting healthier every day and we’re working hard on getting lots of veg into our lunchboxes. As a vegetarian myself,I try to promote eating vegetables to my kids,it is a struggle sometimes as Mr 12 will eat most things, Miss 10 will only eat some and will not try anything new but, Miss 7 will eat anything I put in front of her. I must try these muffins for my 4 kiddos in their lunchboxs as sandwiches get boring and due to school rules the options of what to take compared to what they love to eat (all the no-no foods) are limited. My kids hate vegies and I am constantly trying to hide them in there food…..sometimes wonder how they can be related to me as I have an excellent vege intake. Could really use some more recipes to “hide” even more! I have to say that both myself and my kids don’t really get into vegetables. However, it is all part of the education process for them to see me be the role model and ‘cringe’ over eating peas, capsicum, Brussels sprouts, asparagus etc. Our 8 month old is also currently doing baby led weaning and eats anything so the kids know – if mummy and bubba can eat it – they can too!!! Blog subscriber. I quite enjoy vegies, but it’s hard to get my kids to eat anything other than carrot (raw only) & potatoes. Hubby likes his vegies drizzled with lemon & oil. We love our veggies, but my almost two year olds are beginning to pick them out and throw them! Might need to do some more smuggling with them, and with my eldest about to start school a lunch planner would be a huge help, getting lots of great ideas here too, thanks! My youngest 2 and I are vegetarians – so yes! we like our vegies!! (except for Brussel sprouts and cauliflower – it’s like eating warts – I just can’t stomach them!) My older boys and my hubby are quite good too – but my middle son will pick most vegies out of a meal so we do have to hide them for him – the only way around this is to let him pick them fresh from the garden – he would live on fresh cucumbers, carrots and corn if he could lol! Thankfully the kids enjoy vegies in our house. Oldest boy will usually ask for ‘salad’ (chopped up vegies – minus the lettuce, haven’t quite cracked that one yet) and then proceed to eat them first… But i have still used the Vegie smugglers book as they are really great recipes. I have 3 boys and thankfully they are pretty good with their vegies, however no 2 if the fussiest. If he doesn’t like the look of it, then automatically he “doesn’t like it”. Hubby and I love stirfries, but I only make them for him and I and no 3 will have a little. We love our veggies. One of my children’s fav dinners is what we call a “picky dinner” which basically is raw fruit and veggies, maybe an egg, some nuts, dried fruits, olives etc. it’s as easy as pie and a great way of using up what’s in the fridge. I smuggles some carrots and zucchini into the spag bol today too but would love more ideas on those lines. My 3 year old daughter and I love vegies and fruit. No smuggling needed 🙂 But I would love to win this book to give it to my Sister. She has 4 kids ranging from 17 to 2 … and none of them eat vegetables (except potato and carrots) ..and one of them is vegetarian! eeeek! I love vegetables, especially those that can be eaten raw, and my 2 girls are pretty good with them. I’m in a rut though, we always seem to be eating the same ones prepared in the same way! I would love some inspiration on new ways to cook veggies, and new veggies to cook! These look fantastic and yes we love vegies. My daughter (miss 9)still prefers raw, but will eat them in muffins or slices. I like the look of this recipe Sonia, so much so I’ve just whipped some up for tomorrow’s lunches but with a few modifications. I didn’t have any zucchini & had a few over ripe grape tomatoes so I did the following: 1 carrot, 4 grape tomatoes & 1 small onion, chucked in thermy 5 secs speed 5. Added the milk & 1 egg, 5 secs speed 4. Sprinkled in some mixed herbs & 1 cup of roughly chopped tasty cheese, 2-3 sec speed 4. (I only used 1 cup as that was all I had). 1 cup of whole spelt SR flour, another 3-5 sec speed 4. Dropped spoonfuls on to a tray & they are now baking as you suggested. It smells fantastic! My kids hate veggies.. Pumpkin mash is one thing they will eat.. I don’t eat a lot of veg but I do hide them in our dinner. Grated carrot, zucchini and onion are always added. My kids don’t like veggies, so this book would be perfect for us, thanks for the great giveaway! We love vegies in our house but we do have one difficult eater i would love to get eating more. I love pretty much all veggies with the exception of raw onion, my hubby not keen on one of my favourites pumpkin, kids are pretty good, they prefer raw to cooked, but love bolognese sauce where heaps of vegies are hidden! My husband, my baby and I all love vegies. My toddler won’t touch them. They have to be super-duper chameleon hidden. Not easy but always trying! I love veggies, my toddler does too (although tells me on a regular basis ‘I don’t like lettuce’!) Hubby is a little fussy and only likes certain veggies in small amounts. Our daughter eats more salad than he does! Yummm Vegies are my favourite part of any meal! Unfortunately Miss9 does not share my Vegie enthusiasm. Out of all of us hubby is the most fussy when it comes to veggies, the rest of us love everything, especially our home grown ones! My kids and I love vegies, but different ones! Mr 8 likes his raw salad vegies because he doesn’t like the texture of cooked vegies. Miss 5 loves cooked vegies…except carrots! She would eat raw whole carrots five times a day if she could! I am so lucky that my son loves veggies. He eats 90% of what I put in front of him! I hated most vegetables as a child but now will eat any vegetable mostly didn’t like them as my family always had the same vegetables EVERY night and they were always over cooked and mushy!! My two boys are pretty good with eating whatever is on there plates, but my three year old would live on mashed potatoes and peas and the two year old corn and mushrooms. I eat some vegetables (more than happy to make them into a soup and bamix the lot). My boys refuse to eat most things. One actually becomes ill at the thought!! I am at my wits’ end trying to think up ways! I hope things will get better for them with age (as they did with me) but in the meantime they are running on unleaded in lieu of premiuim LOL. I love veggies BUT my boys can be picky. I’m thinking I need to start smuggling them in because currently I worry they don’t eat enough. I didn’t used to like veggies but now love them and love trying different things with them. My 2yo loved them before he could walk but is now a rather fussy child. More of a fruit lover. These seemed really promising as a way to make vegetables more enticing / less noticeable for a 4-year-old. My batch really got stuck to the foil I put on my baking sheet, though. Lightly coating the foil with oil would have prevented this. The cooking time also seemed off. I had them in my oven at 375℉ on the convection setting for 30 minutes and they were still pretty raw inside.